Coloradan Jim Knous has only been a member of the PGA Tour for a few months, but already he has some memories he won’t soon forget. The former Colorado School of Mines golfer tied for 10th place in his first tournaent as a PGA Tour rookie, at the Safeway Open in October. 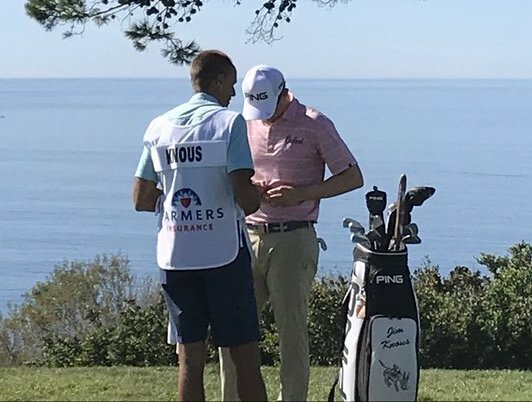 Then on Sunday, in just his eighth career start on the circuit, the 29-year-old not only matched his age with a very respectable 29th place at Torrey Pines in San Diego, but he made the first hole-in-one at the Farmers Insurance Open since 2015. Knous played his final 10 holes in 5 under par and shot a 3-under-par 69 on Sunday. That gave him an 8-under 280 total. Another golfer who grew up in Colorado, Denver native Wyndham Clark, also posted a top-40 finish on Sunday, placing 35th. But after coming into the final round in 11th place, Clark struggled on his final nine holes, playing it in 4-over 40 despite two birdies. Clark closed with a 75 for a 281 total. Justin Rose won the title on Sunday with a 267 total. For all the scores from the Farmers Insurance Open, CLICK HERE.